The Easter Weekend at the Daylesford Spa Country Railway will see a bumper program of Trolley Rides on Good Friday, a special operating day for fully restored 153hp Walker Rail motor 32RM on Easter Saturday, expanded train services on Easter Sunday and a bumper Sunday market. We are running our famous trolley train again on Good Friday to support the Royal Children’s Hospital Good Friday Appeal! Trolleys will be running between 10am until 3pm for a 30 minute return trip through local farmland to the Wombat state forest on Good Friday 19 April 2019. Tickets are available on the day, no need to book. All proceeds from ticket sales will be donated to the Royal Children’s Hospital Good Friday Appeal! So come on down and support this fantastic cause. Please note that trolleys may not operate in the event of inclement weather. Following on from the successful public launch one year ago, 32RM will again feature on passenger train services on Easter Saturday. Experience the world class restoration of this rail motor on a 1 hour return trip from Daylesford to Bullarto and return. Pre-book via TryBooking to secure your seat! 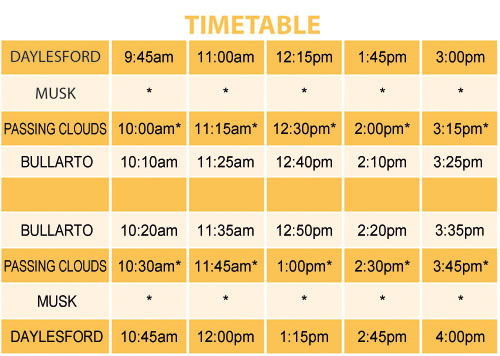 Easter Sunday will feature an expanded timetable with two trains in operation to Musk and Bullarto. A bumper Daylesford Sunday Market will also be held in the station grounds. Train tickets are available on the day - No need to book!